Our Co-CEO’s (Meghan Messenger and Charlie Kim) write a monthly newsletter that we share not only with our staff and family, but also friends of the company (including past Leadership Academy attendees). It includes a sampling of many things happening, summing up as part of our larger mission in changing workplace culture. Meghan and I kept delaying the writing of this update as our calendars were beyond “energetic” the last few months – so here’s combining 2 months of what has happened at Next Jump. Almost every organization we talk to, public and private, for-profit and non-profit, startup or F500, local or global..the MILLENIAL CHALLENGE is their number one fastest growing organizational challenge. An organization’s ability to attract, retain and develop talent are the leading indicators of success or failure. If you don’t know the story of Fisker vs Tesla, Fisker was the electric car company that most analysts and reporters thought would win. However, when you look at where the talent was going, it was going to Tesla, the new car company that at many points surpassed the market value of the big 3 auto companies. When I graduated college in 1995, I wanted a job. I wanted to be independent from my parents, wanted to be able to pay my own bills. I wanted them to know for all their sacrifices, I am now ok to take care of myself. It was a “better me” goal. People no longer work for an organization; they work for a cause they care about. 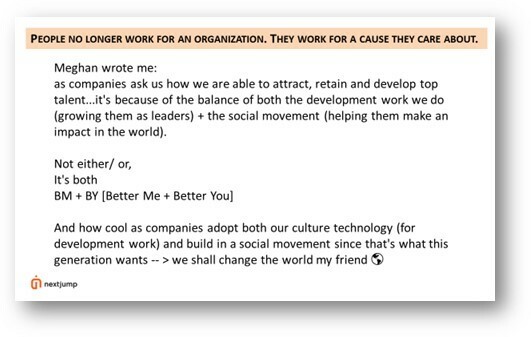 They want to be developed, trained, coached, mentored [better me]…so that they can make an impact, a difference, to change the world [better you]. This is the Millennial Challenge. And organizations started to feel the impact and wake up to it starting in 2015. I found your point on the millennial challenge interesting. 2015 is when the Marine Corps realized it had to change its advertising message to attract millennials. Where past advertisements focused on the challenge and adventure associated with joining the Marines, the new ads focused on the millennials spirit of volunteerism and desire to help people. Instead of focusing commercials on war fighting and combating tyranny (biz 1) they focused on performing humanitarian missions (biz 2) like Tsunami relief missions, providing food, water, medical assistance to civilians. 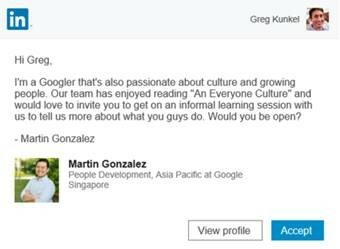 ATTRACT talent – know any millennials? Ask them – what do you want to do in life? Who do you want be? 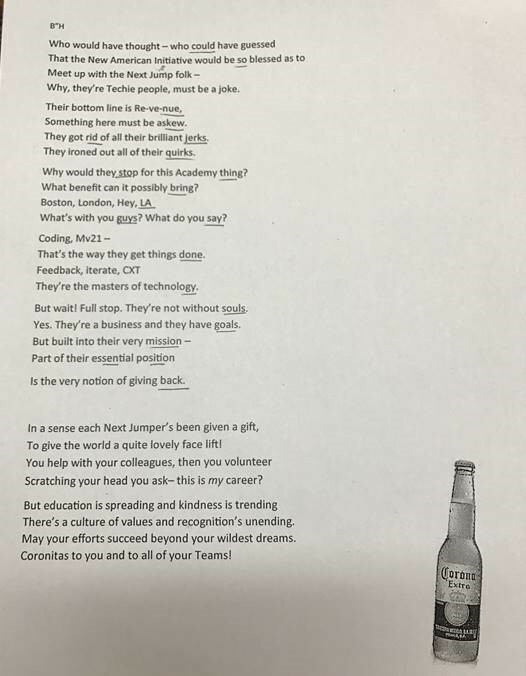 Our last 10 New Hire intros…you will see they all want to change the world. DEVELOP Talent – when lives are at stake…Public school teachers, the person being deployed 9 months who had to indicate how his family would be notified. We are helping and training them. Now let’s work on your impediments. Your ego and pride? Worried about being embarrassed? Paralyzed in fear? You need to get over it. Lives are at stake, you need to grow, get better so that we can help these people. Development is not for wimps. It is far easier to work on yourself – the limiting factors to you succeeding, becoming a better person, a better teacher and coach – when the mission matters. RETAIN Talent – if you attract (get hiring right) and develop (get coaching & training right), retention takes care of itself. We believe you cannot change the world until you fix work first. The lion’s share of capital, technology and talent sits in companies. This is our social movement, to help fix work, not a one-time fix, but culturally [creating new norms]. Two months into 2017 – To be honest – we didn’t expect the kind of interest, take rate for the technology, the growing partnerships from all walks of life, the nonstop and growing interest in our leadership work. It’s been humbling and overwhelming. In the mayhem of our every day, it is often difficult to get perspective. How far we’ve come in a very short time. 2014 – in the last few years, only in hindsight, we’ve come to find that our social mission has been a key driver of our ability to attract, retain and develop the best talent. The social mission first impacted the key leading metrics for business (talent), then ultimately impacted the lagging metrics of revenue and profits. To accelerate doing more, helping more and making greater impact in other organizations, we launched our pro bono Leadership Academy in February 2014. 2015 – we decided to share and give away all the technology as it was the most scalable way to advance our social movement. The technology encodes all the lessons we’ve learned. We changed our main website from corporateperks.com to perksatwork.com to create a platform that went above discounts to include all these technologies to help run company culture [perks that matter include being able to help others, as a team/company, to grow yourself, etc.]. We started to build all culture technology into mobile apps, and launched the 1st five in oct 2016. Clients started adopting/piloting/testing within 30 days – the size of navy, army, fidelity, chase, etc. Metrics, data analytics and technology to help identify TRENDING signals of how people are developing, how through data they can get awareness & acceptance faster, followed by recommendations for improvement – this is the 5th area of focus by our Business 2 [OS for Culture/ Social Movement] team. Adoption – by F500 clients, by nonprofits, government, military, startups, etc. Over a decade ago, we decided to move our Christmas/holiday party from December to February, spend the same amount and get twice as much. 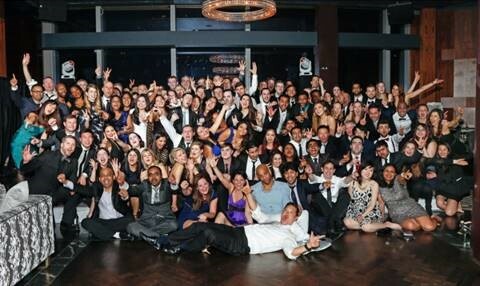 The Dance Competition – The highlight has been our midnight Dance Competition, where each office was given 8 weeks, budgets to hire choreographers, had to have every member of the office participate in 1 of 2 dances – competing w/ judges for the prized trophy and bragging rights on Feb 24th. The defending champions: NYC were dethroned by Boston this year. Our San Fran office joined the judging team. The military uses the simple act of getting troops to march in unison as one of the best tools to train new leaders. It may be easy for you, however getting everyone else to follow and march in unison is extremely difficult. In the same way, taking key revenue/business leaders, who have to be innovative, strategize and then train a company of mostly engineers to learn to dance in front of each other and eventually on stage, taped for Youtube…terrifying and difficult. 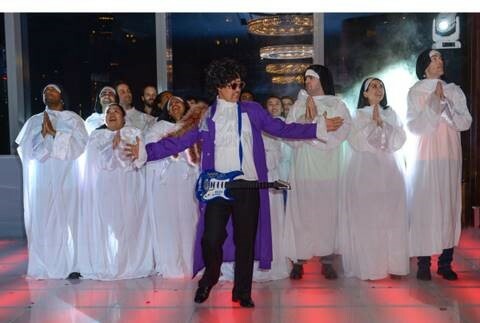 Flash Mob Dance [new tradition] – for the 1st time, we had our NYC dance instructor Mitchell Wayne, lead the entire company through a 3 song dance routine, a flash mob dance of sorts. On February 4th, we held our first Lateral Super Saturday. With the growing number of applicants to Next Jump, we made the decision to create 1 entry point to get hired into the company for laterals (non college recruiting). Note: we planned on 2 lateral Super Saturdays initially but are now leaning towards 1 per year. Applicants from all walks of life applied including leadership from the CIA [which was both an awkward and comical moment for the candidates at lunch as Meghan and I were asking – so what government agency do you work for?]. We hosted a 3-day Leadership Academy 2nd week of February, hosting 42 guests from nearly a dozen organizations (22 in NYC and 20 in Boston). Speaking with Shimon Waronker, the founder and head of The New American Academy (TNAA), he said it is very difficult for everyone to take 3 full days off but last year June when they attended NxJ’s Leadership Academy [1 day], they got a taste of what we offer, everyone was so excited, they had a wait list of people who wanted to attend. The opportunity to work on yourself, develop and learn like this was so rare, everyone did everything possible to come. Education – From Harvard Ed School, leaders recommended by Lisa Lahey, co-author of DDO book. Includes founders of nonprofits, doctoral students, leader of Providence, RI public school. Private sector – 1 EPP client (The Private Bank), plus leaders from 3 other companies. 4 observers – professor from Tufts, Emmanuel college. 2 others from Harvard Ed network. The New American Initiative (NAI) is a school support group founded by Shimon Waronker, founder of The New American Academy (TNAA). In addition to TNAA team, leadership groups from 2 partner schools in NAI will be joining along with their board members. These educators are heavily invested in upgrading themselves as leaders. Dear Charlie, Meghan, Francesca and Rachel, On behalf of the NAI network, I would like to express our gratitude for opening up your practice, feeding us physically, emotionally, intellectually and spiritually. A snow storm was unable to deter our mission to learn and for you to teach. We get many amazing notes from past academy attendees, the programs they’ve adopted and implemented in their organizations. On my front, I’ve formalized and finalized a two-hour course I’m teaching at CIA on your use of cultural initiatives as leadership development and personal growth. I really think our employees can benefit from something like that, so I’m looking forward to leading the first seminar, which will happen in late February. I owe you a debt of gratitude, because without you and your openness, I wouldn’t have the knowledge I do to pass on to my colleagues. I’ll be leading a 2 hour seminar for 24 employees in a course called “Leadership Now, Building Leadership Attributes through Cultural Initiatives.” At the start, I’m going to set the scene for the participants, telling them about how they can demonstrate their leadership attributes through cultural initiatives, and using Next Jump as a real life example of how that happens in practice. At the Academy over breakfast, FuelEd asking “how can we get more coaching from NxJ”? They got ton out of yesterday and super engaged. Boston NxJumper response: we’re very selective and adoption/experimentation is most important criteria to be considered. They all said they are going to go back and try out many things. We love practitioners. Those in the arena working on the greatest barrier to success – the conflict b/w: Logical Self vs Emotional Self. For instance: (1) Would you like to know what people think of you? [everyone says yes]. (2) Who wouldn’t find that uncomfortable? [almost everyone]. #1 and 2 conflict with each other. The top 3 organizations that have demonstrated adoption: PACE Air Force Leadership Academy, Michael Monsoor Navy Ship and Frazier & Deeter (fastest growing accounting firm) – we created a special program to give them VIP ACCESS to Next Jump. We started 2017 with an audacious goal – could we influence, help and train an organization at scale, the size of 100,000+ employees? 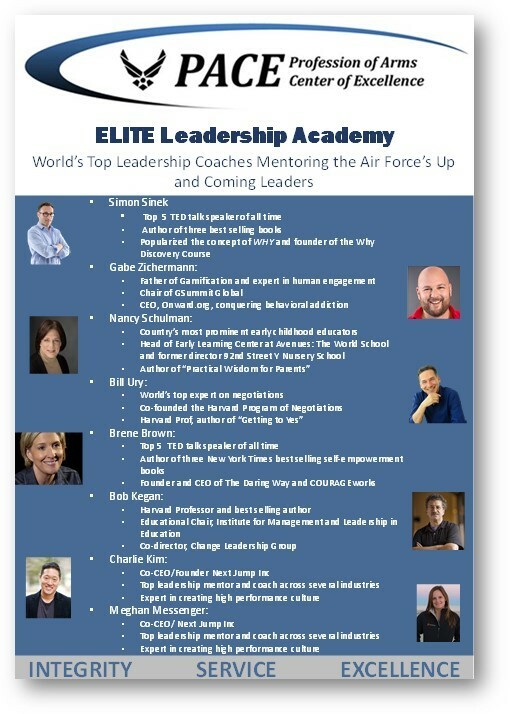 Within weeks we created the Elite Leadership Academy where we pulled together the who’s who of coaches [ECT: Elite Coaching Team] of some of the best leadership coaches we’ve worked with, tried and tested their insights, systematized into programs/culture/technology – reached out and wonderfully heard back with resounding YES’s within a week. The world’s best in diverse backgrounds including children’s education, world negotiations, gamification, adult education, leadership and emotional training. 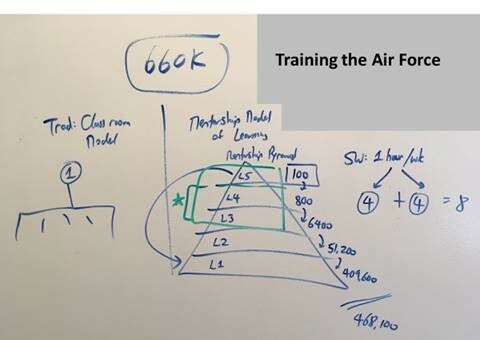 We then had to select a very large organization – and after much back and forth, chose the Air Force – to train all 660K people in partnership with PACE. By applying a mentorship model of learning vs the traditional classroom model, our goal is to train all leaders within the Air Force. The top 100 trained directly by this Elite Coaching Team. Then through 1 hour per week workshops, through a mentorship pyramid (5 levels deep), cover the entire air force. Our audacious goal was to bring together the best of best coaches and then prototype a model that would allow us to help other organizations or even countries – think scale, think big. We learned that one of the greatest challenges in most public schools has been the burden of structured curriculum, often overwhelming the teachers and resulting in little to no innovation in how they teach. In speaking with the principals in both PS119 (our adopted school in NYC) and Netley (our adopted school in the UK), both principals needed help to jump start innovation in teaching. 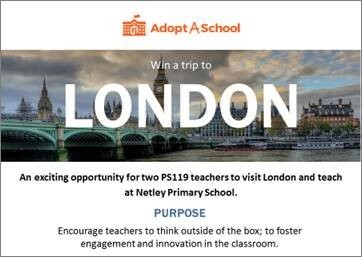 To help, the team at NxJ created a competition, where the top 2 innovative teachers from each school, gets an all expense paid trip to visit the other school (NYC à UK) and (UK à NYC). Elena – Improve attention and focus via wearing slippers in class. The one single overarching difference is in Leadership. Low performing organizations can feel a lack of leadership, who’s in charge, decisions not being made. High performing organizations can feel the opposite. Leadership is the solution. However, sustainable high performance is an even higher bar. It requires leadership training to be cultural (there are always leaders-in-training). Those that do this well, will not only see 1-time but sustained periods of high performance over time. It’s what many refer to as: Scalable. A culture of leadership creates scalable high performance. The number one driver of building a scalable, high performance culture, a culture of training leaders – is to bake TEACHING into almost everything you do. Best form of teaching: “I will teach you everything I know (both good and bad that I’ve done), so that you can do better than me.” In the military, the CO is in charge, but always has an XO, being trained to be the next CO. Do this not only for missions, but for every program and activity touched and impacted by the organization. Suddenly – everything, everyone is being trained to be a leader. Note: NYTimes 2016 most viral article was “Why You Will Marry the Wrong Person”. The gist of the article is that two flawed individuals who aren’t aware of their own personal flaws, getting together, to change the other person – is a formula for disaster. The Greeks saw marriage and love differently – people are imperfect but the point of being together is so that individuals can learn about themselves through the other person (2nd screen). As parents we find the same, our children are mirrors (2nd screens) in helping us learn more about ourselves. 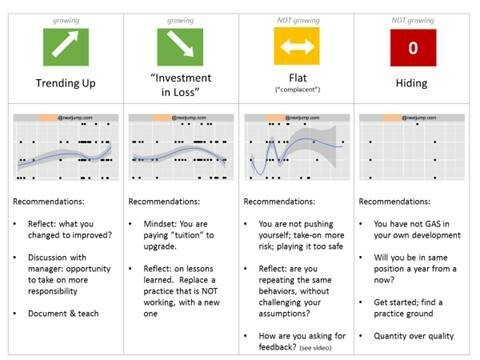 We’ve found when we teach, our students, our mentees, the people we coach – are also 2nd screens, mirrors that help us see ourselves, get to self awareness. Teach more. Become self aware. Only then can we start our training to upgrade ourselves – once we know our starting point. I hope you enjoyed our Co-CEO Update. Please share and forward to your family & friends. Any reactions and feedback – would love to hear from you.